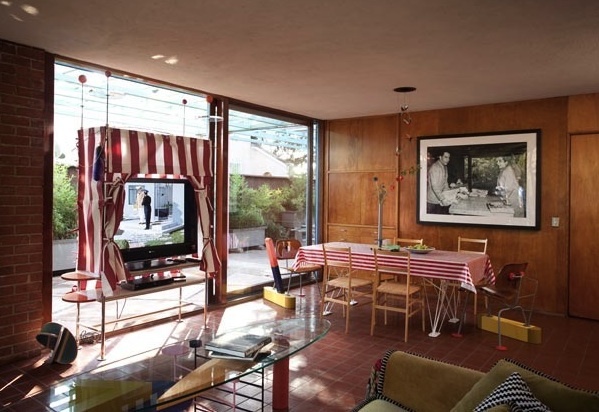 ‘The famous photograph’, as Peter Shire calls it, hangs over the dining table in his Los Angeles home. It shows the moment that his parents, Henry and Barbara, first met. The story is almost too good to be true: she was working for the San Francisco longshoremen’s union, he for IATSE – the union for technicians working in the theatre and entertainment industries. At a longshoremen’s fundraiser, a photographer snapped Henry delivering magazines to Barbara’s table. This being 1946, the early days of McCarthyism and Communist paranoia, the photographer sent one copy of his picture to Peter’s parents and one to the FBI. Peter, an artist famous for his work with the 1980s’ design collective Memphis, was born about nine months later. The FBI photographer was right to be suspicious. Henry and Barbara were card-carrying Communists, part of a bohemian circle of left-wing intellectuals that included artists, designers and architects. Henry, a talented craftsman, also worked with the carpenters’, farm-workers’ and meatpackers’ unions, but, Peter says, ‘got kicked out for organizing’. By the late 1940s, McCarthyism made it increasingly hard for him to find employment. 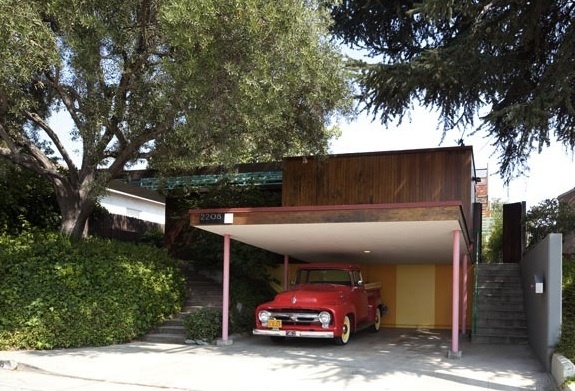 So, when he commissioned his architect friend Josef Van der Kar to design him and his new wife a home in the hilly neighbourhood of Echo Park, near Los Angeles’ downtown, he set about building it himself. The house is clad in vertical slats of redwood, and finished inside with panels of birch ply. Peter has dispatched its original modesty by painting details such as window-frames and doors in turquoise, candy-apple red and dusty pink. He has an apparently insatiable appetite for colour and unusual surfaces. Glazes, paint effects and upholstery all make major contributions to his work, which spans ceramics, public sculpture, furniture design and painting. ‘I don’t know anyone who has as much patience for taking something apart, repainting it, and putting it back together,’ says Donna. Ettore Sottsass first saw Shire’s teapots in WET – the short-lived LA lifestyle magazine that advertised its editorial focus as ‘gourmet bathing’. That was 1977; when Sottsass and a group of fellow Italian designers started their own company four years later, they asked Peter to join them. Memphis epitomised what we now recognise as the Postmodern look: colourful, witty, and obsessed with jazzy patterns and laminates. It had ‘the breathless energy of a three-minute pop song’, in the words of Glenn Adamson and Jane Pavitt, curators of the Victoria and Albert Museum’s current exhibition ‘Postmodernism: Style and Subversion’, in which Peter’s work features. Peter’s Californian sensibility perfectly complimented Memphis’ outlook. He traces Los Angeles’ irreverence and its sense of possibility back to the Gold Rush of the mid-19th century. At that time, he says, ‘between a hundred and two hundred million dollars was taken from the public domain. Out of the ground! People who had no connection to the oligarchy became extremely rich.’ The era was, in its economic and class realignments, perhaps not so different to the upwardly mobile 1980s. Like many people, Peter doesn’t like to be called Postmodern. He prefers the looser term ‘new wave’, which avoids Postmodernism’s conservative neo-historicist associations. 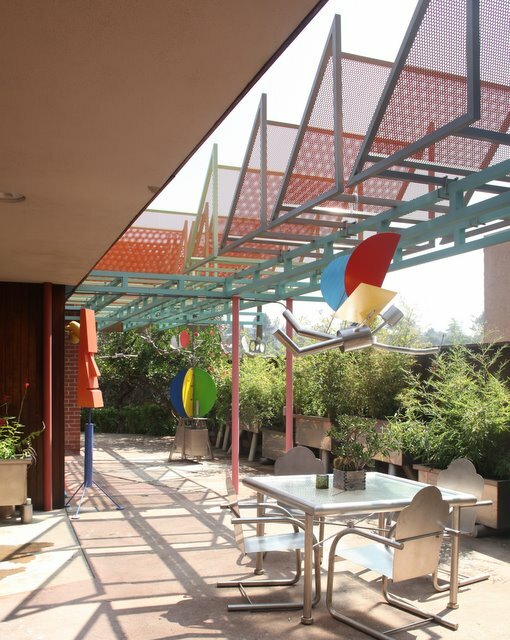 By way of definition, he refers to John Lautner’s 1949 design for a Googie’s coffee shop on Sunset Boulevard. By removing the existing shop-front and re-fixing it, at an angle, back onto the building, Lautner created something radically modern. ‘There it is!’ says Peter, excitedly. ‘Two found objects shoved together to make something completely new.’ Googie, as the style became known, inspired new wave architects such as Frank Gehry to mix high and low materials. Gehry’s buildings feature alongside Peter’s former home in the 1986 book ‘Freestyle’ by Tim Street-Porter, the photographer for this article. Its images of new wave Los Angeles interiors show that the movement was never about luxury or shameless consumption, but relied instead on surprise and invention. Memphis purists such as Karl Lagerfeld, who fitted out his apartment entirely in the group’s designs, were missing the point. Peter and Donna combine Memphis pieces, such as Peter’s iconic Bel Air chair, with vintage finds such as carved African masks and sentimental talking points such as Henry’s scraperboard portraits, or Barbara’s comfy old couch (reupholstered by her son in olive green velvet with jumbo piping and tassels). Donna admits that her own taste leans more towards macramé and heavy craftsman furniture. The pair has learnt to compromise, not just with each other but with their three cats; many of Peter’s louder or more fragile pieces are unveiled only on special occasions.